It was just as well Josh Blue had a sense of humour because every time he returned to the US after touring abroad with the US Paralympic football team he would be greeted with blank stares. The parawhat? The excitement of playing before cheering crowds in Europe and South America would dissolve in the indifference and ignorance of his home country. The striker and his disabled teammates would play domestic games in near-empty stadiums. "It'd be just our relatives." Even after competing in the 2004 Games in Athens, Blue, who has cerebral palsy, returned home to silence and shrugs. "Unfortunately it just doesn't get any play here." A stand-up comedian, it was not until he won NBC's reality show, Last Comic Standing, in 2006 that the American public woke up to his talent, off the field at least. Blue has a self-deprecating humour focused on living with disability which enchanted viewers and critics. A "palsy punch" was effective in a fight, he said, because "first of all, they don't know where the punch is coming from, and second of all, neither do I". There was little funny, however, about US ignorance of the Paralympics, a vacuum which left American competitors envious of the support disabled athletes enjoyed in other countries. "You'd hear about all these projects and think, wow, why aren't we doing that?" said Christine Tinberg, founder of Bicycling Blind Los Angeles, a group which matches blind people with sighted riders on tandems. London's Games, however, may signal a turning of the tide. Companies like Visa and General Electric are featuring slick commercials with disabled athletes to endorse a range of products. Some disabled athletes are finding additional audiences through social media. 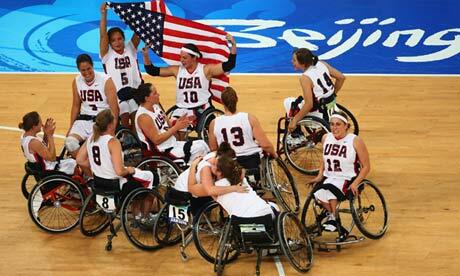 Disabled military veterans-turned Paralympians are tapping patriotic sentiment. NBC recently announced it would scale up coverage, previously virtually non-existent, to four hour-long programmes on NBC Sports plus a daily highlights package via the US Paralympics YouTube channel.That pales in comparison with Channel 4's Paralympic fest of an estimated 400 hours, or even the BBC's patchy coverage in 2008 when it showed daily highlights and live coverage at the weekend. Nevertheless Sir Philip Craven, the International Paralympic Committee president, celebrated NBC's announcement. "It's tremendous news that the London 2012 Paralympic Games will get more airtime in the US then ever before and thoroughly deserved." But why has the US been so resistant until now? And to what extent is it embracing the London Games? Beth Haller, a professor of mass communication at Towson university who has written about disability issues, said apathy was largely the result of media neglect. Television networks shunned past Games, she said, leaving viewers unaware there even was a competition for disabled athletes after the regular Olympics. "Much of it boils down to the economic structure of our media. It concentrates on what will make money, and it thinks the Paralympics won't do that." A student who analysed the 2002 Salt Lake City winter Paralympics discovered US journalists scrambling for the airport once the regular Games ended while many foreign journalists stayed on for the Paralympics. Another reason for apathy, said Haller, was that US medal success in the Olympic Games sated national pride, unlike some smaller countries which viewed the Paralympics as an opportunity for consolation medals. Even so, the US amassed 99 medals in Beijing, coming third overall. US awareness has been negligible even among the disabled. Growing up in Minnesota, Blue, a talented footballer from an early age, did not hear about the Paralympics until the age of 22 when a sports-loving disabled friend said: "You know there's a team for you, right?" Soon after Blue was scoring goals for the Paralympic squad, but it rankled that he could have been doing so years earlier. "Elsewhere, especially Europe, there's much greater awareness and respect." A glimpse of disabled elite athletes in action, he said, was usually enough to hook fans. "Have you seen a wheelchair basketball game? They kill each other out there." Tinberg, who recruits braille students for her bicycling group, said many initially gasped at the idea of becoming athletes. "They've never heard of it. They're like, cycling blind, really? How does it work?" After awareness, the biggest problem was lack of resources. "Most blind people are unemployed and bikes are expensive." Disabled war veterans have given the media a new reason to cover the world's second biggest sporting event – an event founded in 1948 to help rehabilitate injured British veterans. Of the US delegation 20 are veterans, of which six were injured in combat. "The veterans are having a huge impact. It pulls people's hearts. And the government is putting a lot of money into sports facilities for them," said Tinberg. Last week she was seeking a sighted rider to team up with a recently blinded 21-year-old female soldier. Push Girls, a reality television show following the lives of four glamorous LA women in wheelchairs, has helped nudge disability issues towards the cultural mainstream. "Things are changing. I see a lot more awareness," said Kenneth Riptoe, executive director of One with Water, a swimming club associated with the Paralympic movement.Most agree. The US Olympic Committee said NBC's expanded coverage meant Americans would see more of the Games than ever before. In a statement NBC, which did not respond to interview requests for this article, said it would conclude coverage with a 90-minute special show on September 16, a week after the Games end. That did little to appease critics who said it was all still too little. "Hey, NBC found a whole 90 minutes for the Paralympics! In the middle of the afternoon! A week after it's over! Woo hoo!" wrote one blogger. Blue, who is no longer on the US Paralympic squad, said he will follow his beloved football team from afar. Their first game is against Ukraine, a powerhouse ranked third in the world. "But they're getting old. We think we can take them."